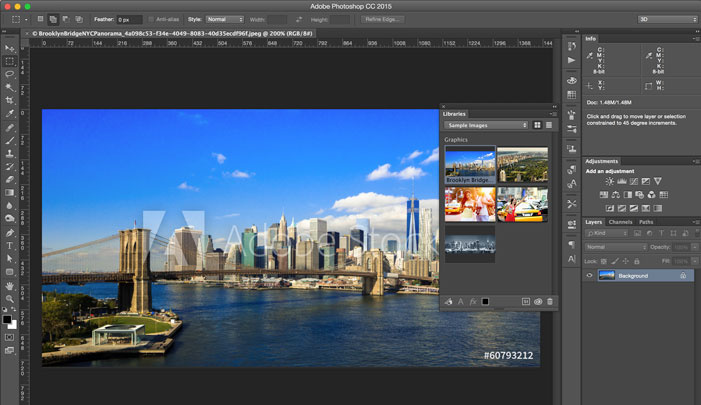 CALIFORNIA – Adobe Systems Inc is leveraging its popular Creative Cloud software suite for its new stock-image service, but will have to dig deeper to woo designers and take on established players such as Shutterstock Inc and Getty Images. Launched on Tuesday, Adobe Stock is a repackaged version of Fotolia, which Adobe bought in January. The company is offering the product at a significant discount to users of its Creative Cloud suite, which houses the popular Photoshop and Illustrator tools. It will also be available as a standalone service. But analysts said it would not be easy to lure customers away from Shutterstock and the product may even be a hard sell to existing Creative Cloud users, at least in the near term. “I think that Creative Cloud users could potentially experiment with Adobe Stock, but I don’t think that the content is there right now for them to switch over,” Topeka Capital Markets analyst Blake Harper said. For one, Adobe Stock needs to boost its inventory. It offers 40 million images, while Shutterstock has a gallery of over 56 million images. “I think the magnitude of the lead that Shutterstock has is kind of under-appreciated,” RBC Capital Markets analyst Rohit Kulkarni told Reuters. Getty, one of the oldest in the game, offers more than 25 million images under its iStock brand, apart from other royalty free images. The company boasts a total inventory of over 100 million images and serves a large editorial clientele. Adobe’s entry could unsettle Getty, which is struggling with financial problems and has been discounting to retain users. Topeka’s Harper said Adobe would also need to sort out the “bad blood” between Fotolia’s management and U.S. contributors over payments. Analysts have said Adobe Stock needs more variety, especially U.S. content, as Fotolia was more popular in Europe. The key to winning the war could be pricing. Adobe Stock’s annual subscription of 750 images is priced at $199.99 per month, a dollar more than Shutterstock’s “professional” package. Getty’s premium iStock photos cost $333.25 per month, while a cheaper collection costs $166.58. It will take time for Adobe to gain critical mass, and meanwhile Shutterstock could lower prices to attract new customers, Morningstar analyst Norman Young said. Still, Adobe is confident that it will be able to take a “big share” of the $3-billion total available market, the company’s Chief Financial Officer Mark Garrett told Reuters. Adobe expects $75 million in revenue from Adobe Stock this year. Shutterstock’s CEO and founder, Jon Oringer, declined to comment on whether the company expects Adobe Stock’s launch to alter market dynamics.